In the office where I intern, it’s not unusual for someone to turn on the TV and let Fox News play quietly all day. I don’t pay much attention to it, but about twice an hour they play a commercial I cannot stop watching. 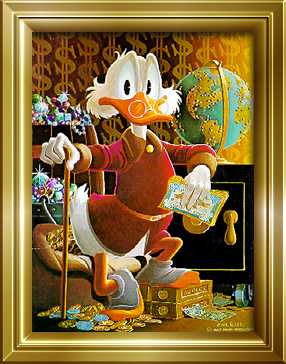 I found a picture of him! I’m completely fascinated by this commercial because my life could not be more different. I leave my unpaid internship and scrounge around the bottom of my purse to find enough loose change to buy ramen for dinner. I’ve saved enough that I’ll be ok for a little while, but until I get a job, the next few months are going to be pretty tight. I certainly won’t be making commercials about how fabulous all my gold feels when I rub it on my face. I’ve been applying for part-time jobs for a couple of months now, but I hit some snags because my availability is crummy at best. There’s really only one solution: If businesses can’t hire me because of my schedule, I’ll have to start one of my own. All I need to do is find a niche and fill it, right? – I’m really good at sitting! – I’m better than anyone I know at eating! – I like going to bars! – I have excellent hygiene! – I’m pretty good at carrying things as long as they weigh less than me! – I’m extremely awkward. In a fun way! – I have this here blog! – I can do a variety* of celebrity impressions! – I’m not afraid of dumpsters! – I know where the nearest costume shop/lingerie store is located! Street Performer: My city would benefit from some street performance art, and I have the perfect act. “Stephanie: Incredible Conjuror of Awkward Moments!” I’ll set up a sign and a hat, sit on the sidewalk, and wait for people to approach me. Then I’ll do what I do best, which is putting my foot solidly in my mouth and making situations uncomfortable. I’m a natural! If I can find an outfit, I may also dress up like characters from pop culture and offer to take pictures with people on the street. Unfortunately, since the only local costume shop I know of is also a lingerie boutique, the characters might be slightly risque. Maybe that’s better! 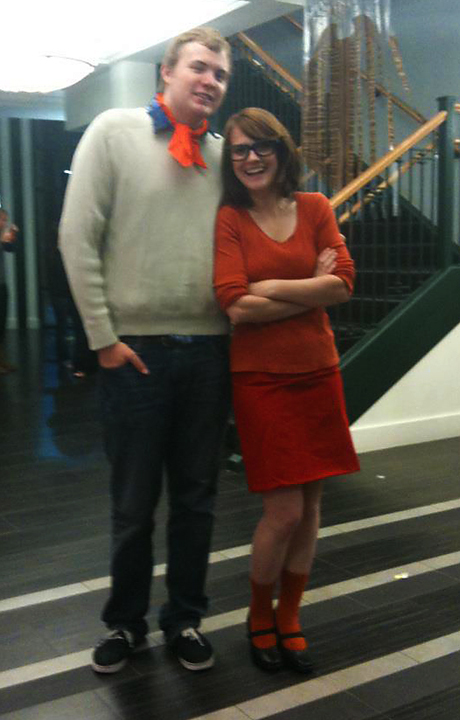 I own a pretty modest Velma costume. Fred is not included. Bellhop or Bathroom Attendant: I’ll hang around hotel lobbies and offer to take people’s bags to their rooms. When I’ve carried their suitcases in, I’ll stand stiffly in a corner with my hand out for a tip. I’ll probably have to spend my initial profits investing in a uniform and maybe a cart, and fancy gloves at the very least, but it’s worth it. Alternately, I could stand in any restroom with a towel, some mints, and a lint roller or something, and then I’ll dry people’s hands for them, offer them mints, and clean their shirts for tips. There’s no establishment, including gas stations and Wal-Marts, in which I won’t dry hands! These both have an element of danger– I could be thrown out by angry management– but I like to live on the edge. Human Ad Space: I am more than willing to create an ad for a business, draw it in Sharpie on an old T-shirt, and wear that T-shirt in a public place for an allotted number of hours. Please note: I won’t do anything cool while wearing your ad. I’ll probably sit around and read a book or something. Don’t get your hopes up. Wingwoman: I’ll go with you to a bar and talk you up to other women. I’ll laugh really hard at your terrible jokes and say things like, “Man, it’s too bad we’re just friends because you’re the best ever! Any woman in this bar would be LUCKY to take you home!” I don’t know if it will work, but we might as well give it a whirl. You have to buy all the drinks, of course, and try not to be creepy. It definitely won’t work if you’re creepy. Blog Product Placement: Look! It seems super easy: “I’m sitting here drinking a Coke, thinking about all the reasons it’s a great beverage. 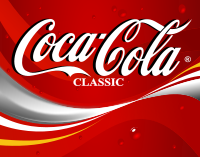 Please read this HILARIOUS list based on Coca-Cola!” Ta-da! Product placement. New media. Innovation. America. Other words that make you want to give me money. Wake-Up Calls: I’ll call you in the early morning to make sure you wake up! And since I can perform TWO WHOLE IMPRESSIONS, you could get an early morning phone call from either Mickey Mouse or Sarah Palin for only a dollar more. How’s that for the best part of waking up? Dumpster Diver: Did you lose something in the trash? Are you too cheap to buy stuff, but not too cheap to pay someone else to hop in a dumpster for you? I’m your girl. I will jump in almost any dumpster, as long as you give me a boost up there and agree to call the police if I find a body because I’ll be busy screaming. Oh man. I have to go make 10 ads on Craigslist. Not to be creepy, but I always did prefer Velma over boring ol’ Daphne. That costume is great. Velma is definitely the best. It turns out no one knows who you are if you don’t have the other members of the gang with you, though. Most people just thought I was me with thicker glasses. But, can you do the two impressions at the same time? Because that would be….interesting. I’ve never tried it… but now I’m going to. Read your blog incessantly, and I’m not worried about what that says about me. Keep it up! I’m in the same boat after college to, so, cheers. Ha. I’m pretty sure it says you have an excellent taste in Internet and maybe a little too much free time. Thanks for the encouragement! Good luck to you, too! Thanks! I’m doing my best to keep the old chin up, but it’s making my posture kind of weird and I’m worried it may be affecting my job interviews. “If businesses can’t hire me because of my schedule, I’ll have to start one of my own.” Lol seriously, why not? I’ve been reading your blog from time to time and you seem like a very intelligent and creative person. If you really storm your brain, I’m sure you can come up with a fun original idea and be the boss! Ha. All I can do is Mickey Mouse and Sarah Palin. I don’t know how well recording them will go… but if it ever happens you’ll be the first person I tell. The entrepreneurial direction may not be a bad way to go (though if really going with the options you listed, please don’t opt for the dumpster diver – that would be icky at best). I actually had a friend who was laid off by her company right after she bought a house a few years back. She decided to take her pastime of making bead jewelry beyond the hobby realm and now all those pretty necklaces and bracelets still help pay her mortgage! Jewelry making sounds WAY better than dumpster diving. Why didn’t I think of that? Some part of my brain was like, “Hey, you know what’s a good idea? Jumping into piles of trash! You know what’s a bad idea? Making jewelry!” There’s something wrong with me. I’ve always wanted to go dumpster diving, actually. To be honest, this is probably my fate. I might have to move ten-thousand miles away just to find a job when I graduate. Otherwise, I could be a very clever hobo. Or a couch surfer. I’m pretty sure I could combine the two. If you ever need a clever hobo plan of action, I totally have one. At this rate, I may also be implementing it, but the more the merrier. Dumpster diving is actually pretty fun, if you wear the proper protective gear. Good luck with finding a job closer than 10,000 miles away! Thanks! Maybe I’ll meet some crazy people in college that are just as impulsive and insane as I am. Love your career opportunity ideas! It’s been a year since I graduated and I’m still trying to figure things out. Also, I’ve nominated you for the versatile blogger award! Thank you very much! I’m honored and shocked. I’m also a little worried that neither of us is ever going to figure this whole “life” thing out. I guess I’ll just keep thinking of backup plans, and I’ll let you know if I find a good one. You’re welcome! I’m worried too. I was supposed to have figured something out by now. I’m not sure what, but something. But don’t worry, I’m sure our skills will payoff at some point in the near future, hopefully sooner rather than later. And thanks, I would very much appreciate having the knowledge of a good backup plan, seeing as all of mine tend to be mediocre at best. It’s that can-do attitude that turns ramen into solid gold! you mean there could be jobs for wingwomen! That would be just perfect for me too! Ps I like the dress and boots and hope you get a job to fit them really soon!